A new Lithuanian drama, "Kanarėlė" (The Canary) had its premiere in Chicago. Its author, Kostas Ostrauskas, is the youngest of the young generation of Lithuanian playwrights. "Kanarėlė" is a symbolic play, humanistic and problematic, although it avoids specific social and moral issues. It has few personages and its action is intensely internal. The characters are poverty-stricken beggars, but in their shacks one finds a symbolization of a larger problem: the break-up of human illusions. 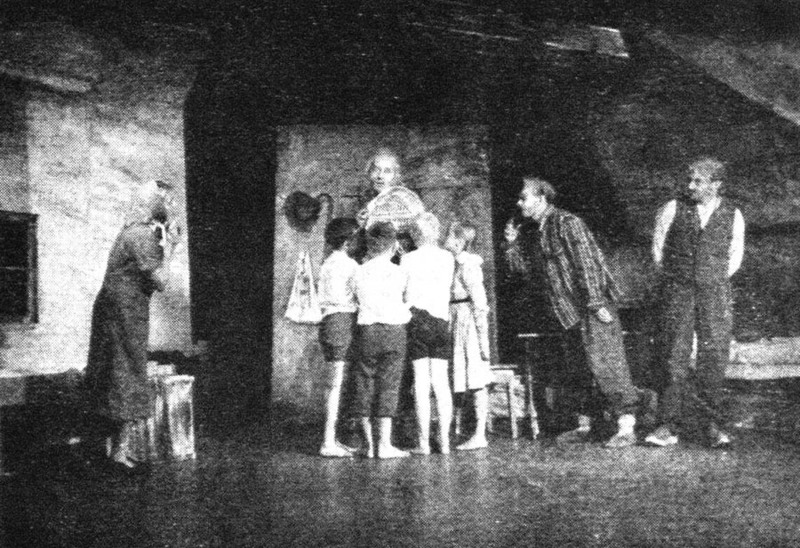 The main character in the play is Juosapas, a blind beggar, who, although in an extreme state of poverty, still finds a unique respect for himself among his neighbors. His friend, Jokūbas is jealous of this unique honor. One day, Juozapas returns with a stolen canary, hoping that the bird, with his wonderful song, shall brighten his hut and bring him happiness he has never known yet. The canary is stolen, but Juozapas' conscience remains silent, for he believes that all men regardless of their present stat? of destitution, and not only the chosen ones, are entitled to happiness. With the canary, conflict is brought into the beggar's hut. The relations between Juozapas and his friends Rokas and Jokūbas are changed, and he himself, later, begins to doubt whether his act is justifiable. The jealous Jokūbas, desiring to destroy Juozapas' happiness, and disregarding the fact that he also shares in it, tempts Rokas and Aneliuke (Anne) to steal the bird. This is quickly accomplished; a sparrow is substituted in the cage. Psychologically unable to reconcile himself to the loss of the canary, Juozapas, wakes up deal in the morning. It is easier for him to reject all hearing, than face the loss of the canary's scng. In this manner, he loses all contact with men and the world; he now is both deaf and blind. Juozapas' friends, correctly realize that their friend's tragedy was caused by their actions. They try to correct their crime, but in vain. While trying to bring the canary back, Aneliuke accidentally lets it escape, and it is lost irretrievably. The malefactors are deeply shaken.Rokas, who has sworn never to enter another parish, even if forced to do so, now takes up his beggar's pouch and goes out into the world. Juozapas is also experiencing an internal conflict. As if realizing that his personal way of reeking happiness is opposed to morality and tradition, he decides to return the canary. He does not know, that he is carrying a sparrow, and thus becomes a tragicomical figure. "Kanarėlė" does not take place on a social level.. Ostrauskas nowhere criticizes the social system. The play moves on a level of ideas. It symbolizes the right of each individual for happiness and beauty, as an ancient folk-tale about a king who became shepherd.